In 2013, law student Shana Knizhnik started her tumblr blog after the Supreme Court decided Shelby County v. Holder, which did away with a crucial provision of the Voting Rights Act and Justice Ginsburg read her dissent from the bench, something that is not done. One review equated Ginsburg's unusual act with "shaming your spouse in front of dinner guests." And this came after Ginsburg read to other dissents the day before. 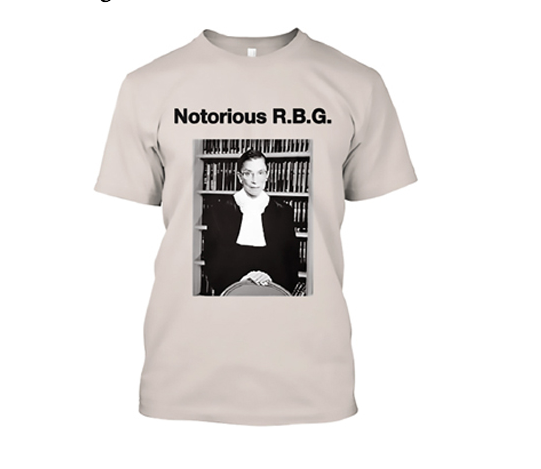 Almost overnight RBG became notorious (the "notorious" in the name is nod to Notorious R.B.G., the rapper who was murdered in 1997). "Can't Spell the Truth without Ruth" stickers and posters, t-shirts, Halloween costumes and all other sorts of pop culture items were emblazoned with this icon. Working with journalist Irin Carmon, Knizhnik turned her blog into a book that is now, with the help of Kathleen Krull, award winning author of non-fiction for kids, available in a young readers' edition! 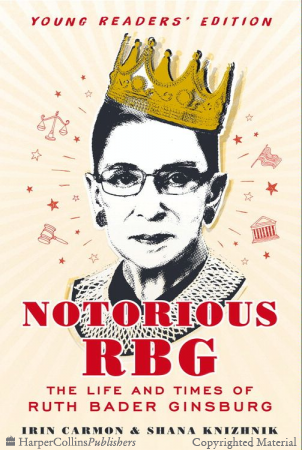 What you can expect to find in Notorious RBG: The Life and Times of Ruth Bader Ginsburg: Young Readers' Edition is a highly readable work of "fan nonfiction" that does a great job at putting Ginsburg's accomplishments and personality into context for young readers. 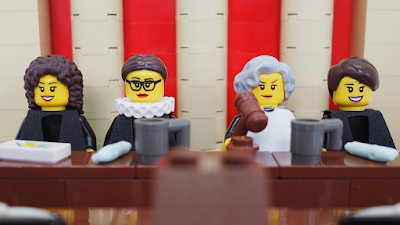 Using all kinds of images that will immediately engage young readers, the authors focus on the obstacles RBG had to overcome as a woman in her profession, including the infuriating story of the dinner at the dean's house in 1956. A student at Harvard Law School, Ginsburg, along with the eight other women attending law school at the time, were asked by Erwin Griswold to justify their place at law school when they were taking the place of a man. 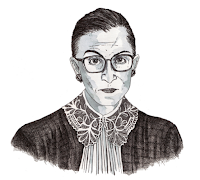 To add to this, during her time at Harvard Law School, there were no women's bathrooms in one of the two buildings where classes and exams were held and, ever more surprisingly, there was a reading room that held a journal RBG needed and she was not allowed access to it because it was in a men's only reading room. There was even a guard to make sure women didn't get in. 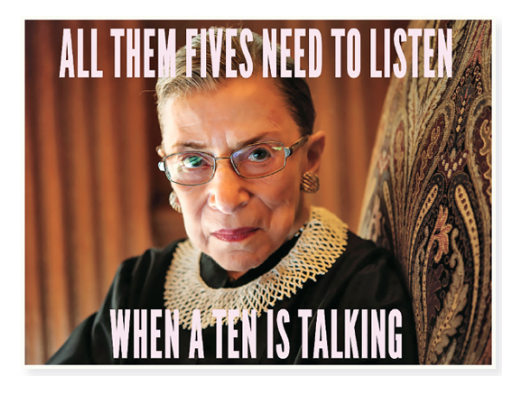 The authors also provide essential supporting information, like timelines (one that shows gains made by women over time) and lists, including things women couldn't do in the 1930s and 1940s, 9 things to know about the Supreme Court (SCOTUS), definitions of legal terms and a page on the jabot, RBG's trademark. 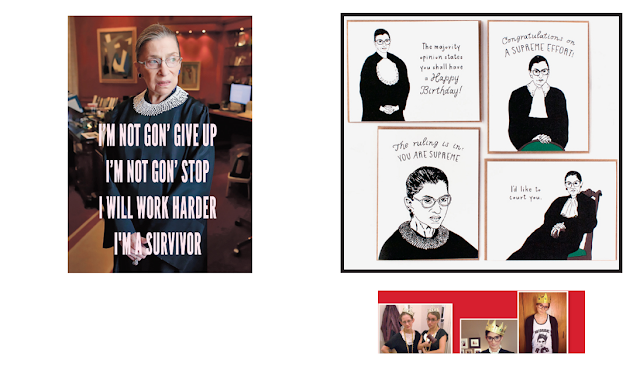 These are rounded out with quotes from RBG and images of important documents from her work, including a page of notes with some charming doodles. Notorious RBG: The Life and Times of Ruth Bader Ginsburg, Young Readers' Edition is an important book that needs to be read. I tend to assume, despite the amazing books hitting the shelves in recent years, that most kids will not choose to read a biography willingly, and I hope I am wrong. However, this is a book that I truly believe they will want to read and also a book I can easily see being shared reading for parents and kids, especially as a read out loud. It's filled with the kind of facts that make you want to turn and shout out to the nearest person, "Listen to this! You'll never believe what happened to RBG!" Thanks so much for this lovely and thoughtful review!